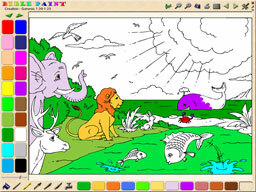 Kids as young as two years old will get hours of fun mixing colors and coloring in a great variety of Bible coloring pages. And it's not just for kids. We have had many grown ups tell us that they love to do some coloring in too! It is very relaxing.